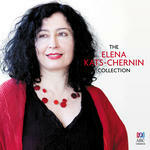 Golden kitsch : percussion concerto / Elena Kats-Chernin. Instrumentation: Solo percussion, 2 flutes, 2 oboes, 2 clarinets, 2 bassoons, 2 horns, 2 trumpets, 2 trombones, tuba, percussion (3 players), piano, harp, strings. 11 Feb 2017: at MSO Plays Kats-Chernin (Sidney Myer Music Bowl). Featuring Benjamin Northey, Melbourne Symphony Orchestra, Claire Edwardes. 30 May 2015: at West Australian Youth Orchestra (Perth Concert Hall). Featuring Claire Edwardes, Peter Moore, West Australian Youth Orchestra. 3 Dec 2011: at Darwin Symphony Orchestra (Darwin Entertainment Centre). Featuring Claire Edwardes, Leif Sundstrup, Darwin Symphony Orchestra. 12 Mar 2011: at Grand Pianola Music (Queensland Symphony Orchestra Ferry Road Studios). Featuring Queensland Symphony Orchestra, Claire Edwardes, Marc Taddei. 2 May 2010: at Ku-ring-gai Philharmonic (Bowie Hall, Brigidine College). Featuring Claire Edwardes, Ronald Prussing, Ku-ring-gai Philharmonic Orchestra. 1 May 2010: at Ku-ring-gai Philharmonic (Bowie Hall, Brigidine College). Featuring Claire Edwardes, Ronald Prussing, Ku-ring-gai Philharmonic Orchestra. 12 Jul 2009: at Sydney Youth Orchestra (Verbrugghen Hall). Featuring Max McBride, Sydney Youth Orchestra, Claire Edwardes. 11 Jul 2009: at Sydney Youth Orchestra (Verbrugghen Hall). Featuring Claire Edwardes, Sydney Youth Orchestra, Max McBride.